What does RSS mean? 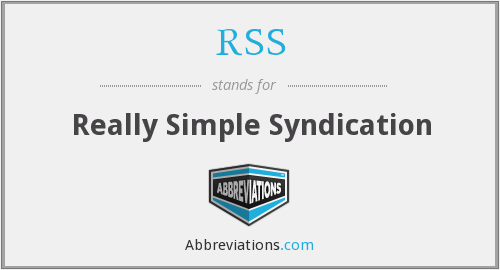 This page is about the various possible meanings of the acronym, abbreviation, shorthand or slang term: RSS. RSS; originally RDF Site Summary; often dubbed Really Simple Syndication, uses a family of standard web feed formats to publish frequently updated information: blog entries, news headlines, audio, video. An RSS document includes full or summarized text, and metadata, like publishing date and author's name. RSS feeds enable publishers to syndicate data automatically. A standard XML file format ensures compatibility with many different machines/programs. RSS feeds also benefit users who want to receive timely updates from favourite websites or to aggregate data from many sites. Subscribing to a website RSS removes the need for the user to manually check the web site for new content. Instead, their browser constantly monitors the site and informs the user of any updates. The browser can also be commanded to automatically download the new data for the user. Software termed "RSS reader", "aggregator", or "feed reader", which can be web-based, desktop-based, or mobile-device-based, present RSS feed data to users. Users subscribe to feeds either by entering a feed's URI into the reader or by clicking on the browser's feed icon. Couldn't find the full form or full meaning of RSS? Know what is RSS? Got another good explanation for RSS? Don't keep it to yourself! "RSS." Abbreviations.com. STANDS4 LLC, 2019. Web. 20 Apr. 2019. <https://www.abbreviations.com/RSS>.